The eye-drenching vistas of gorgeousness in this movie about California’s wines is perfectly captured by cinematographer Mike Ozier. The lush, rich colours and sprawling, almost carefree landscapes fill the anamorphic (2.35:1) screen, but never pompously. 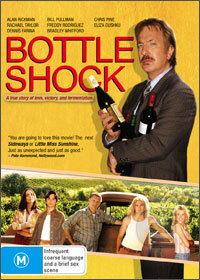 Bottle Shock is based on a blind tasting in Paris in 1976, in which an American wine outscored French ones. Naturally this caused a massive stir in the media and wine world. Alan Rickman plays Steven Spurrier, an impossibly snobby English francophile who actually suffers from Parisian snobbery. His struggling wineshop looks like folding because he remains an outsider of the ‘scene’. To remedy this, he and a friend devise a grand tasting between Old World and New World wines. It is needless for me to hide the outcome of this American under-dog story. I don’t think even the filmmakers bother. Rather, what we have here is a heart-warming story about the trials of putting together a vintage. At its core, the father-son relationship is very endearing. I was also happy to see Freddy Rodríguez (of Six Feet Under fame) back on the screen, albeit playing another Hispanic semi-stereotype. Looking at the long list of producers and writers may help explain the slight feeling of unrestraint and looseness in director Randall Miller’s feature, which just wouldn’t happen in an auteur movie. You notice some rambling in certain scenes and the overall thread loses focus by the end. However, if you love wine (which I do), Bottle Shock is great fun. The transfer to DVD is very clean, with vibrant colours. Sound options are Dolby 2.0 or Dolby 5.1, which I think is very considerate! Extras include Deleted scenes and the 12 minute Chateau Montelena Winery Featurette. Buy it if you like wine and or you plan on visiting the much-vaunted Napa Valley, USA.